Accessories: Accompanied by Patek Philippe Extract from the Archives confirming production of the present watch in steel with gold bezel, silvered dial, applied gold hour markers and tachymeter scale in 1947 and its subsequent sale on June 25, 1948. 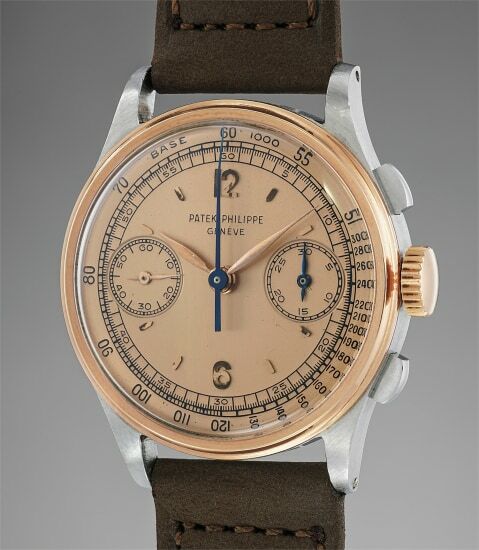 Reference 130 is one of the most diverse chronograph models that Patek Philippe ever produced. In production from 1936 until 1964, the model was cased in predominantly yellow gold. Fewer amounts were cased in pink gold, steel, with steel and gold combinations among the rarest case configurations. The dial variations were numerous and displayed a range of styles, from sector designs to pulsations scales. The present example is one among an exceedingly rare number of reference 130s cased in stainless steel and pink gold. To date, no more than eleven examples have ever graced the auction market. Most notably, the case construction of this model is slightly different than its precious metal counterparts. The lugs are slightly thicker but shorter in design. Furthermore, the diameter is slightly larger at 33.5 millimeters, giving it a decidedly modern appearance and substantially more presence on the wrist. This particular timepiece is the earliest known pink gold and stainless steel reference 130. Preserved in superb and remarkable condition, this watch displays very crisp finishes and sharp edges. Even the back of the lugs retains crisp bevels, which would have instantly disappeared with moderate polishing. Furthermore, the pink dial is preserved in very impressive condition. The hard enamel signature is crisp, and the scales are all visible and raised. A light layer of patina has developed on some of the numerals, attesting to the untouched nature of the timepiece. It is a very rare occurrence to find a dial in such unspoiled condition.